I don't know many of you people, end up searching solution's for IVR of your business, and then involve a third party that charge you more than they provide you services, especially when you want a change in services, they charge for every single change. What's today I am going to tell you is about a website, which can make IVR like an ABC and you just need a knowledge of drag and Drop. What I will say about this incredible service is "No Code's Just QuickFuse !" 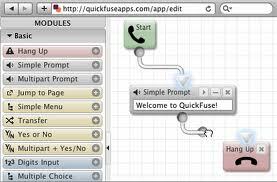 Yes, the QuickFuse introduce an incredible service in which you can just drag and drop things, and make your own applications of IVR. Drag and drop voice apps. Why write pages of code when you can drag and drop your way to a full featured IVR application? Design and build your application naturally and intuitively with QuickFuse. You'll have a working prototype in minutes. Need to greet the caller? Drop in a simple prompt. Need to get an ID number? Drop in a digits input. Then connect it all together. It's fast and easy. Might be helpful for people looking IVR Solutions.